An easy example of this is the Sun, Earth, Moon system. Earth is a satellite of the Sun, and the Moon is a sub-satellite of the Earth. The Moon orbits the Earth because the earth is about 380,000km (237,000 miles) from the Earth. This is well within the Hillsphere of the Earth, which has a radius of 1.5mkm. A Hillsphere basically defines as the space where the Earth's gravity is more important than the Sun's gravity to another object. If the Moon somehow ended up outside the Hillsphere of the Earth, the Moon would orbit around the Sun instead of the Earth - just like all the other planets, asteroids and comets. Jupiter's Hillsphere is much larger than the Earth. That's partly because it has more mass and more gravitational gravitational pull, but especially because it is further away from the Sun, so the Sun's gravity is much weaker at Jupiter than at Earth. This Jupiter a much bigger gravitational influence - one reason why Jupiter has a lot of moons. Not only has it got a big Hill radius, but it's also far enough from the Sun to have its own gravitational dominance. So if we look at the Earth's Moon, it could have a sub-satellite. The Moon has its own hillsphere with a radius of 67,000km (37,000 miles). This is where the sub-satellite could exist. If an object lies outside of the Hillsphere of the Moon it would therefore orbit the Earth instead of the Moon. The only problem is that the sub-satellite cannot stay in orbit around the Moon because of tides. Like almost all the moons in the solar system, our Moon has a synchronous rotation (ie. they have the same face to their planet at all times). This results on tidal forces between the Earth and Moon... the same tidal forces that cause high/low tides on Earth. 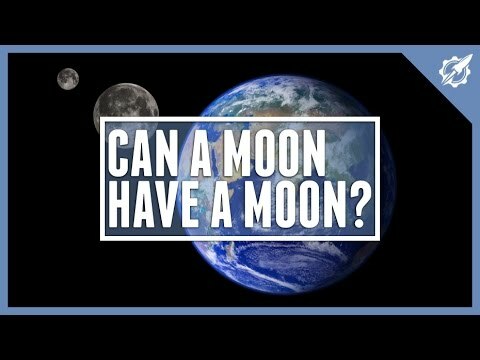 So any sub-satellite orbiting the Earth would have its orbit decay until the sub-satellite crashed into the Moon or until it was pulled apart by the Moon's tides. Home > Cosmology Corner > Can a Moon Have a Moon?